The pressures college students face during college and the social anxiety many have to deal with during these sensitive years may represent a gateway to drug and alcohol abuse. Binge drinking, experimenting, and drug use are some of the quick fixes students utilize to cope with stress, the massive course load, and peer pressure. Although addiction trends in college students and graduates tend to shift every year, it’s becoming abundantly clear that students are at high risk of substance abuse and addiction during enrollment as well as after graduation. 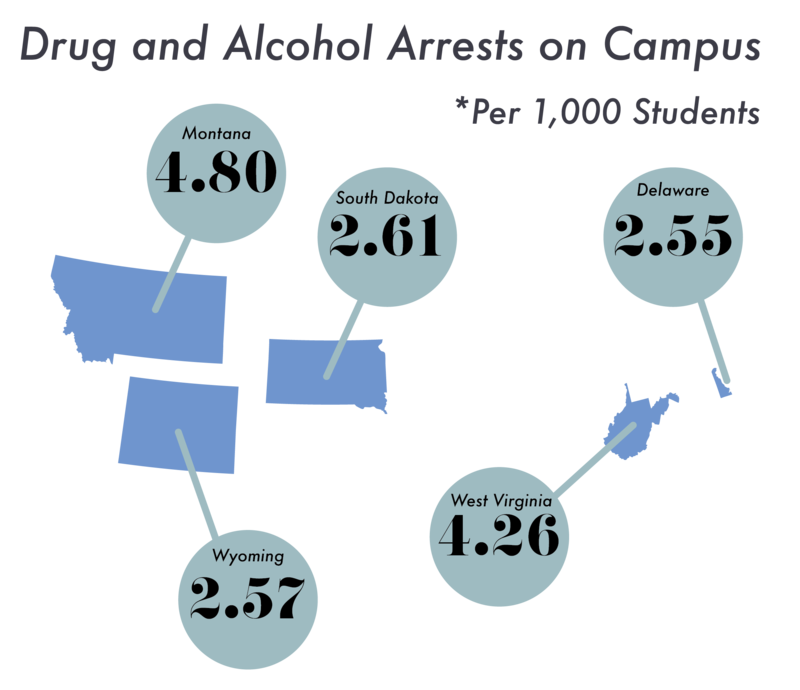 Unfortunately, there’s little data available that could help us understand the entire scope of substance abuse and addiction levels on college campuses. However, according to the Jeanne Clery Act, colleges that receive public funding must provide reports on the crimes taking place within the perimeter of the university. These reports, which contain details on crimes related to drugs as well, are then published by the Office of Postsecondary Education. This information can help paint a picture of drug usage rate on college campuses, though they by no means provide a definite answer to the question at hand. These states had, on average, 2.3 times higher chances of drug-related arrests. Moreover, Alaska had the most significant rate increase in campus drug arrests, though its total rate remained relatively low (0.93 rate). 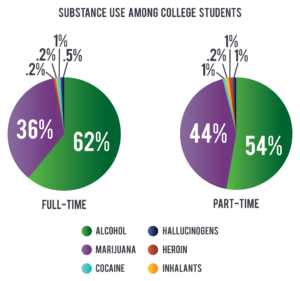 Many psychologists consider college as a turning point from adolescence to adulthood. During this time, young people can live independently for the first time and be faced with making important decisions without supervision from guardians or parents. This sudden freedom students get during college can also make them susceptible to drug and alcohol use. According to the Substance Abuse and Mental Health Service Administration, more than one-third of full-time college students (aged 18-22) engage in binge drinking, while one in five use illicit drugs. The institution also noted that substance use is one of the more severe public health issues concerning young adults in the United States. The problem can create adverse effects on health, social, and economic levels not just for the students, but also for their families and the communities which they are a part of. Approximately 5.4 million full-time college students (roughly 60%) reportedly drank alcohol in the month before the SAMHSA study. 3.5 million of them reported to binge drink, 1.2 million were heavy drinkers, and 2 million used an illicit drug. 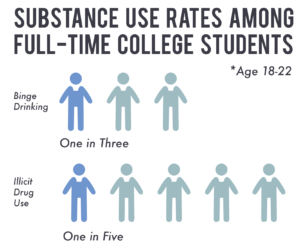 The SAMHSA report underlines that college appears to be a time when young people start engaging in substance use. 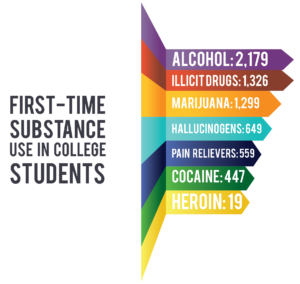 Of all substances, alcohol was, by far, the most frequently consumed drug by first-time, part-time, and full-time students, followed by marijuana. 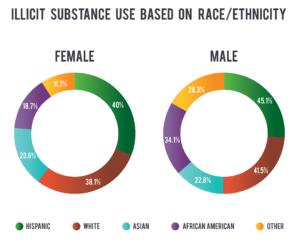 Heroin and inhalants were the least frequently used of all the categories. A study published in the U.S. National Library of Medicine about the associations between race or ethnicity and 12-month rates of substance abuse found that consumption percentages tended to be higher for Hispanic and White students than for Asian or African American ones, especially regarding marijuana use. The same conclusion was valid for both male and female students. To properly comprehend why drug and alcohol abuse among college students is such a widespread issue, it is vital to address the reasons why some young people may turn to reckless behavior during their university education. Substance abuse and substance addiction are two utterly different things. 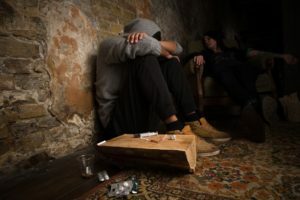 Substance abuse refers to the behavior of continuous consumption of drugs and alcohol while addiction appears after long-term abuse and indicates that an individual’s body has formed a dependency on the substance, and cannot control their reaction to it. When it comes to college students, it can be difficult to assess whether someone is abusing a substance or is already addicted to it. A lot of campus environments (such as college parties or fraternities) have a high degree of illicit substance prevalence, which puts young people in direct contact with drugs and alcohol, increasing the chances of drug and alcohol consumption. But, determining if a particular student is abusing a substance or is addicted to it is vital to their recovery. For instance, substance addiction is a medical issue and requires a comprehensive process towards rehabilitation while drug abuse is considered a behavioral problem that can successfully be treated through counseling or therapy. Experts must consider a variety of things when trying to determine what pushed a college student towards substance or alcohol abuse. However, young people can benefit from an array of different resources, should they decide to overcome their addiction and get sober. For instance, many campus counselors can help students by guiding them to the appropriate resources for the exact problem they are facing. Additionally, many educational institutions offer students groups, student health centers or online resources that they can access whenever they feel the need. While these in-college resources might not be able to offer the solution to the addiction itself, they can help support and guide the student through their path towards a sober life. If the problem at hand is not substance abuse but addiction or substance dependency, then it’s vital for the student to receive comprehensive medical aid to turn their life around and get sober. Substance addiction is an extremely complex problem, one that does not just affect college students, but many average Americans. Recovery from drug and alcohol addiction often starts with detoxification, a process during which doctors try to eliminate the addictive substance from the patient’s body. But recovery from an addiction holds many stepping stones, and the detox process is just the first. 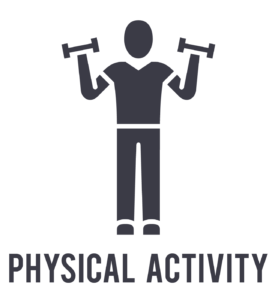 College student facing this health issue can benefit from the help of rehabilitation programs that offer complete care to patients. According to the National Institute on Drug Abuse, these programs have a high success expectancy regarding full rehabilitation, especially if patients remain under treatment for a proper amount of time. 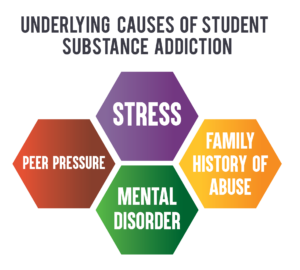 Understanding why the student started abusing a certain substance and then consequently become addicted to it can be instrumental in deciding the proper treatment. Clinics that provide outpatient or inpatient recovery programs are known to have some of the most comprehensive forms of treatment for drug or alcohol addiction. After the particular needs of the students have been identified, college counselors can then direct them to an appropriate program. Inpatient treatment programs will see the student admitted into a 24/7 clinic during their time of recovery. They can remain under treatment for several months, depending on their medical file and needs. 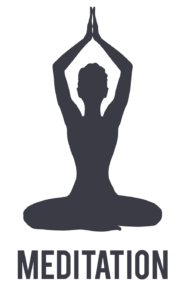 During treatment, patients receive individualized care that consists of detox treatment, therapy sessions and other treatment methods the clinic employs, all while remaining under the supervision of the medical staff. Outpatient care, on the other hand, does not require patients to be admitted full-time to a clinic. During their treatment, students can continue with their daily activities while also participating in therapy sessions to help their recovery. The frequency of clinic visits, as well as the methods employed, are decided based on the revision of the college student’s particular case. However, it’s important to state that if medical detox is needed, students must be admitted to the clinic for at least a week (depending on the nature of the addiction) to remain medically supervised while the drug is eliminated from their system. Detox can bring forward many unpleasant symptoms as a result of withdrawal, and as such, it is better for the patient to be monitored during this time. Moreover, outpatient care might not be suited for everyone. 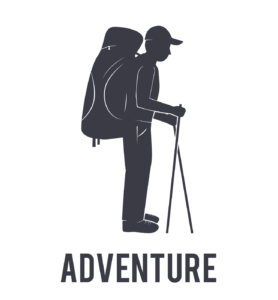 Many students can receive an inpatient treatment as a recommendation, as it allows them to fully concentrate on their recovery and disconnect with the outside world. For instance, if the student became addicted to drugs because they were trying to cope with academic pressures, it is better for them to detach from college duties and focus entirely on their rehabilitation in an inpatient program. An addiction treatment plan will differ greatly from patient to patient, as it is done based on the individual needs of the college student. Moreover, the type of program chosen for treatment, as well as the clinic that provides it are also factors that may influence the treatment plan, since several of these centers can employ different methods of approaching addiction. During this step, the doctors try to completely remove the substance to which a college student is addicted from their body. It is often one of the more unpleasant stages of rehabilitation due to the withdrawal symptoms. The severity of withdrawal differs from patient to patient, but if they remain supervised at this stage, then the medical staff can administer any necessary medication to relieve pain and monitor the patient’s condition. Behavioral therapies can help address the patient’s mental and emotional state. A considerable part of addiction recovery involves helping the patient improve their mental state, identify the root of the addiction, and help them manage their recovery. 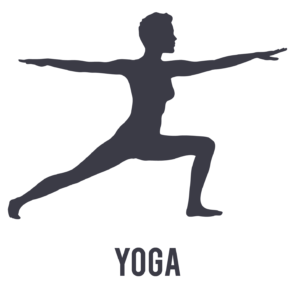 Some rehabilitation programs can also incorporate alternative approaches to addiction treatment. 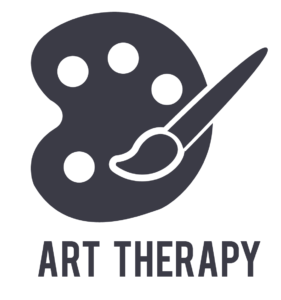 As such, they employ several leisure activities with the purpose of helping students acquire new skills or competencies, as well as offering them an escape during treatment. Many alternative programs can be instrumental for students in learning how to manage cravings and avoid relapse, mainly when they are discharged from the clinic. 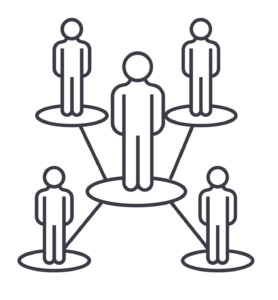 In addition to the treatment options described above, students with addiction issues are also encouraged to join support groups during their rehabilitation. Such groups can provide students with the necessary tools to maintain a sober life, manage cravings, and avoid relapse. Many support groups for drugs and alcohol addiction are available to students on campus, making it increasingly easier for students to manage their recovery and their academic life. A paper published in the U.S. National Library of Medicine criticizes that although there is increased interest in the scope of substance abuse and addiction on U.S. campuses, there are few resources available for students who want treatment. Those that exists can go severely unnoticed.